This metric tells us how many (Search) impressions are being lost (as a percentage) of the total available impressions due to budget. 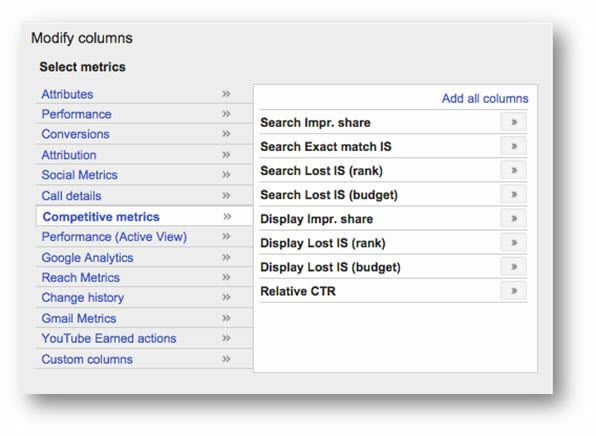 Daily budgets are set in AdWords for each campaign, when budgets are being met each day you may find that this limits the exposure of your ads. Consequently campaigns limited by budget will not allow ads to show all of the time. This differs from the first two metrics in this category as it refers to the percentage of impressions lost rather than the percentage of impressions gained. The solution to this problem is fairly straightforward; simply increase the budget! Often this is not possible, unless the campaigns affected by this are profitable / delivering ROI increasing budgets can create larger losses. This would be an increase of (12,500 - 5,000 = 7,500) 7,500 Impressions; it is then possible to apply CTR to this figure to estimate the increase in Clicks.